In an era when bullpen has higher profile that starters it is surprising to see a team that prides itself on analytic decisions trade away the pitcher with the most potential and raw stuff to the American League's best team. Yes we got two prospects, but they are still raw and a gamble while Pressly is 29 and in his prime. Of course all our pitching gurus must answer for the disparity between his 3.40 Twins ERA (not bad) and his 0.77 Astro ERA (amazing). Or his whip - 1.364 Twins and 0.60 Astros. He generated twice as much WAR in 1/2 as many games with the Astros. "Only three pitchers who threw at least 60 innings this season have had a swing-and-miss rate higher than Pressly: Craig Kimbrel of the Red Sox, Edwin Diaz of Seattle and Josh Hader of Milwaukee, three of baseball’s elite relievers." 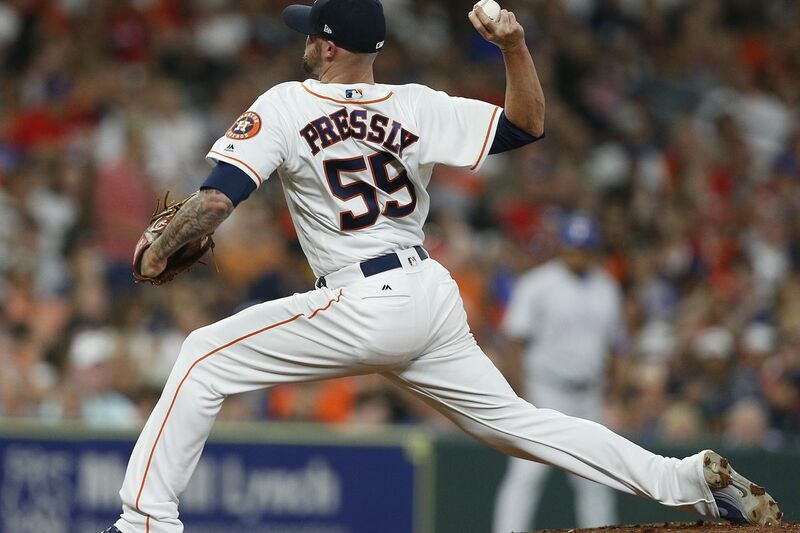 "Pressly is the latest pitcher to experience a renaissance in Houston, which has been at the forefront of baseball’s analytics revolution. Charlie Morton has posted the two best years of his career, Gerrit Cole allowed fewer hits and struck out more than he ever has — leading baseball with 12.4 strikeouts per nine innings — and Justin Verlander has rediscovered his Cy Young form at 35. All three were All-Stars this season." Yes our FO is gaining an unearned reputation as analytics leaders, but the proof is in the way the roster is constructed and the players develop. So far not so good Now we will seek to build a weak bullpen by hitting the FA market and hoping we find a guy who can make the pen better - a guy like Ryan Pressly.